Searching for the perfect place to spend your vacation, honeymoon, or anniversary trip in Tahiti? For such a special trip it’s tempting to stick with the tried and true, big brand hotels. You want to know exactly what to expect—we get it. But, have you ever taken that leap of faith, booked the unknown boutique or bed and breakfast, and the experience surpassed your greatest expectations? Like you’ve uncovered this rare and special secret? We have three of these hidden pearls to share. Even better, we’ve tried them for ourselves. No leap of faith needed—these are the best Tahiti resorts for offering quaint luxurious charm, world class hospitality, and delightfully unique accommodations. Located off the island of Tahaa, Vahine Island Resort is a perfect Polynesian paradise situated on a private motu. With only nine bungalows (six beach front and three overwater) you’ll enjoy ultimate seclusion. 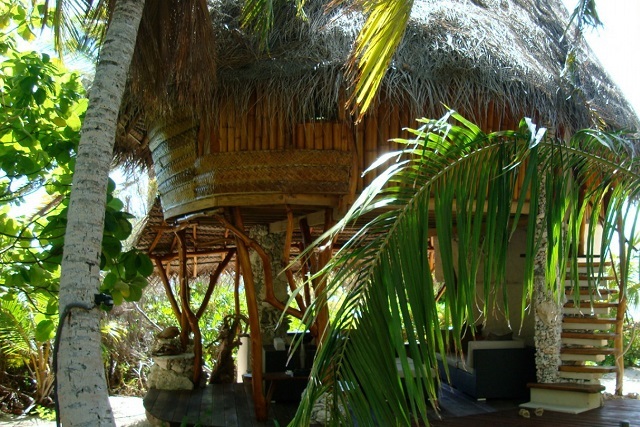 The accommodations are authentically Polynesian with an abundance of natural woods and beautifully bright cotton linens. Run by husband and wife team Laure and Terence, we love the delightful staff who engage their guests daily. You’ll have plenty to keep you busy (if you wish) with nature tours, snorkeling, and coconut demonstrations just to name a few. But might we suggest you also enjoy the Farniente (pleasant relaxation in carefree idleness). Dining at Vahine Island Resort is incredible with plate presentations that resemble a spread in bon appetit. Terence is a phenomenal chef sourcing the freshest in local fruits, vegetables, and lagoon fish. He’s famous for his house made vanilla yogurt—you’ll have tasted nothing like it! The engaging staff, delicious food, and overall charm of this resort are what keep their guests coming back year after year. 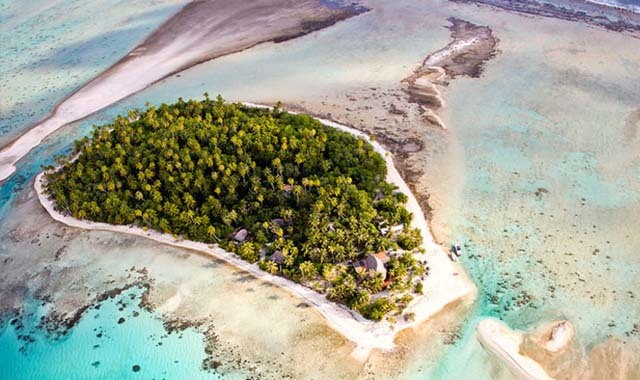 Ah, the Ninamu Tikehau Resort, where castaway seclusion meets five-star luxury. This beautiful resort offers seven distinctive bungalows—each entirely hand crafted of natural materials from coral walls to coconut palm roofs. A superb example of sustainable luxury, this eco-friendly resort also runs almost entirely on solar energy. This is unspoiled beauty at its finest; seen in the turquoise lagoon, near-pink beaches, and friendly black-tipped reef sharks welcoming your arrival. Adventure seekers will love the surfing, snorkeling with dolphins, kite boarding, and abundant fishing opportunities. Oh, and did we mention the hospitality? You’ll be welcomed as friends, invited to the lounge each evening where owner Chris prepares cocktails, and share stories and photos of the day with other guests. Meanwhile, Chris’ wife Greta works to prepare a delectable meal of freshly caught deep sea fish. Ninamu is truly the perfect combination of adventure, luxury, and romance! If you’re looking to completely unwind (and unplug) Le Sauvage Private Island offers the refuge you’re seeking. Situated on a pristine private island just south of the Rangiroa atoll, this jewel is nestled perfectly among coconut and palm trees. The five bungalows have been artfully created with aito wood, woven bamboo, pandanus—it’s as if they’ve naturally risen into their surroundings. What makes this hideaway so special is its simplicity; there is no electricity, no phones, no internet, and we promise you won’t miss them! Instead, you’ll enjoy languid days under the sun, paddle canoeing, exploring the reefs, or relaxing in the breeze after a picnic. After sunset, the island is lit purely by lanterns and the moon. The complete darkness provides the most vivid display of stars you will have ever seen. Le Sauvage is a destination and experience to be shared with someone very special. And, while there may not be Wi-Fi, you will never feel more connected. NOTE: Le Sauvage will be closed for renovations beginning May, 2018. A reopen date has not yet been established. Each of these hidden treasures is special in its own way–offering something unique that you won’t find anywhere else. If you’re ready to plan your next getaway to one of these best kept secrets, contact our Tahiti Travel Specialists today!